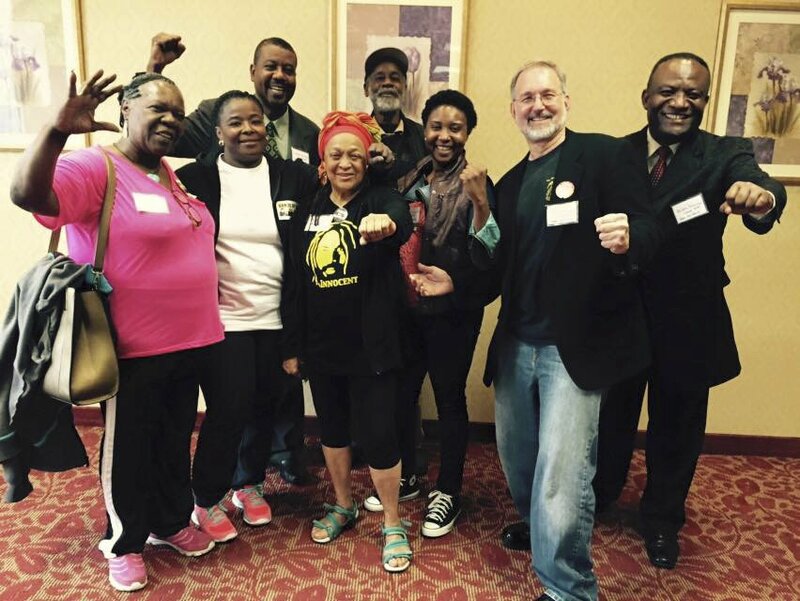 Members of newly elected slate of USW 8751 with Pam Africa (center), May 9. Secaucus, N.J. — The United National Antiwar Coalition held its fourth national gathering in Secaucus, N.J., May 8-10 under the theme “Stop the Wars at Home and Abroad.” Over 400 delegates from the U.S. and Canada took on the task of challenging endless U.S. imperialist wars abroad and the increasing militarization of domestic police from Ferguson, Mo., to Baltimore. 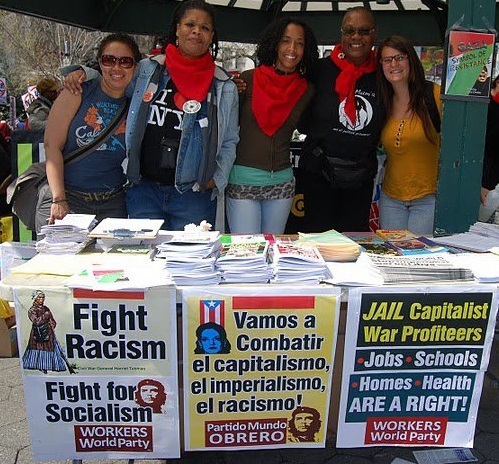 This conference was unique in the history of the U.S. anti-war movement, which has never before so clearly taken up the need to oppose the war waged against oppressed communities in the U.S. Support for the resistance of Black and Brown youth who are standing up to an epidemic of police brutality was a central theme of many panels and workshops. Solidarity messages came from Ukraine, Canada, Cuba, Germany and Britain. Formed in 2010, UNAC has become the largest anti-war coalition in the U.S. today, with nearly 120 member organizations opposing U.S. wars in the Middle East, Africa, Asia and Latin America. UNAC co-coordinators are lifelong anti-war and labor activist Joe Lombardo and social justice activist Marilyn Levin. 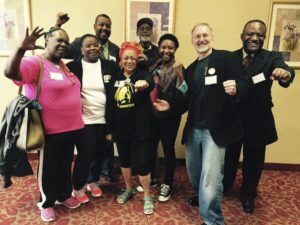 Hamm urged UNAC to endorse the July 25 Million People’s March against Racial Injustice and Economic Inequality in Newark, N.J., initiated by POP. Longtime anti-war activist Kathy Kelly challenged people in the U.S. concerned by images of beheadings carried out by the Islamic State to study the history of the U.S. military, which includes the slaughter of thousands of surrendering Iraqi soldiers in 1991 and the deaths of over 500,000 Iraqi civilians, mainly children, from U.S.-imposed sanctions. Afternoon panels took up support for political prisoners and the cost of endless war and austerity. Alejandro Molina urged support for the May 30 March to free Puerto Rican political prisoner Oscar Lopez Rivera. Also raised was the need to free two international political prisoners held in U.S. jails — Dr. Aafia Siddiqui of Pakistan and Simon Trinidad of the FARC (Revolutionary Armed Forces of Colombia). Lynne Stewart, former political prisoner, received a standing ovation after her remarks about fighting for human rights. Pam Africa invited everyone to Philadelphia for a mass rally marking the 30th anniversary of the police bombing of MOVE. 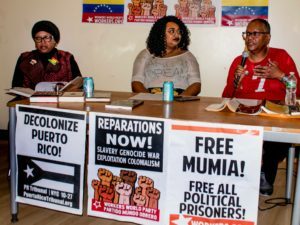 She gave an update on the serious health crisis facing political prisoner Mumia Abu-Jamal as a result of prison officials attempting to murder him through medical neglect. A highlight of the afternoon session was a delegation of Boston school bus drivers from United Steelworkers Local 8751, who have been fighting a nearly two-year battle against attempts by transnational corporation Veolia to bust their union. USW 8751 President-elect Andre Francois described recent victories, including pushing back a company move to jail union founder and Vice President-elect Stevan Kirschbaum and the stunning, landslide victory of union progressives who captured all positions in the local’s April 30 election. But, Francois noted, the battle continues to reinstate four union leaders, including himself and Kirschbaum, who were illegally fired in October 2013. Sara Flounders, of the International Action Center, and Imani Henry, with the Brooklyn, N.Y., anti-gentrification group Equality for Flatbush Project, chaired the final session on May 9 billed as “Tribunal on the Militarization of the Police & Structural Racism.” Flounders noted that 1.5 million Black men are “missing” in the U.S. today — many victims of prisons, rotten medical care and police violence. Henry asserted that police brutality and gentrification go hand in hand. He described hundreds of police checkpoints in Brooklyn and Manhattan that target youth of color in order to push them out of their neighborhoods and make room for wealthy whites. The panel included Orange, N.J., teacher Marylin Zuniga who is fighting efforts of the Fraternal Order of Police to have her fired after her third-grade students spontaneously wrote get-well letters to Mumia Abu-Jamal. Resolutions passed at the final conference session on May 10 included a call to support Black Lives Matter and other anti-racist, pro-women and pro-lesbian-gay-bi-trans-queer groups calling for actions on May 21. There was also a call for coordinated anti-war actions in October. A resolution supporting Iran’s Red Crescent ship taking humanitarian supplies to challenge the U.S. and Saudi Arabia blockade of Yemen passed unanimously. Audio and video coverage of this historic conference are at Go Pro Radio Network and Community Progressive Radio (cprmetro.org). A complete list of speakers, panels and workshops is available at unacpeace.org.